Are you currently building a temporary sheep yard? Our light duty clips are a perfect way to securely connect your panels. Our panel clips, also known as cleats, are a light duty panel clip, making it perfect for temporary small animal yards. They are designed to fit a 25mm pipe or 25mm RHS. Each clip is made from zinc plated steel, ensuring it is strong and long lasting. Do you sell heavy duty panel clips? Yes. 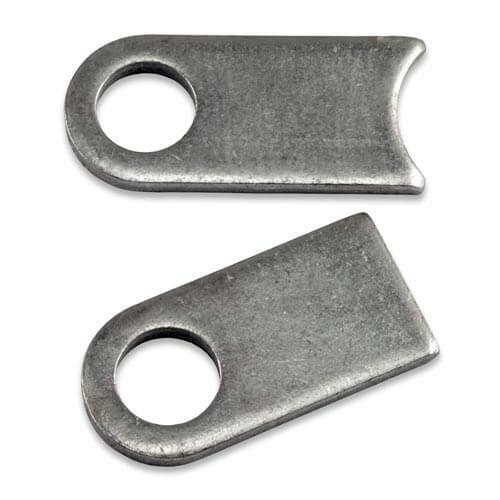 We also sell heavy duty C panel clips and L panels clips. If you are looking for a stronger product check out our heavy duty panel clips. Where you have two panels meeting, one clip will need to be above and the other clip will be below. Rather than trying to have the two clips at the same level offset them by 50mm to 100mm. Our 12mm drop pins are 150mm long, which is gives you plenty of space, however the closer the clips are together the better. By having less space between the two clips, it will reduce the amount of rattling which can spook your animals. On the right hand side of your panel, position your clips 100mm down the panel. On the left hand side of your panel, position your clips 150mm down the panel. Tack your clips to your panel, check that they line up with corresponding panels. If they do, weld them on. The trick is to be consistent with the placement of your clips. By doing it this way, you can add more panels to your yard and be confident they will easily connect in.